This Deluxe Direct Ocean Front Corner Condo at Sandcastles has a view of the Ocean from the Private Balcony and the Master Bedroom!!! This spacious condominium has two bedrooms, two bathrooms, and full kitchen with all the amenities. The condo has a huge master bathroom with Jacuzzi bath and dual his and her sinks. The master bedroom has a KING Size Bed with a NEW mattress and the other bedroom has a QUEEN size bed and a Full (Double) bed. The Master Bathroom has a Jacuzzi Bath which is big enough for two and dual his and her sinks!!! There are LCD TVs and DVD player in the living room and the master bedroom both with cable TV. We added NEW living room furniture including a deluxe lazy boy chair. Facilities available in the condominium complex include outdoor heated swimming pool, jacuzzi, and tennis court. There is lots of close-in private parking. Very Clean And Neat!!! 'SPECIAL' - Most weeks in the FALL after Sept 10th are on special if booked from Saturday to Saturday!!! Local attractions include the Cape Canaveral (Kennedy) Space Center, Sterling Casino Cruise Lines, Ron Jon's Surf Shop, Ocean Fishing, and Golfing. Watch the Space Shuttle launch from the beach. Less than an hour north is the Daytona Speedway or continue up the coast to tour Beautiful Saint Augustine. 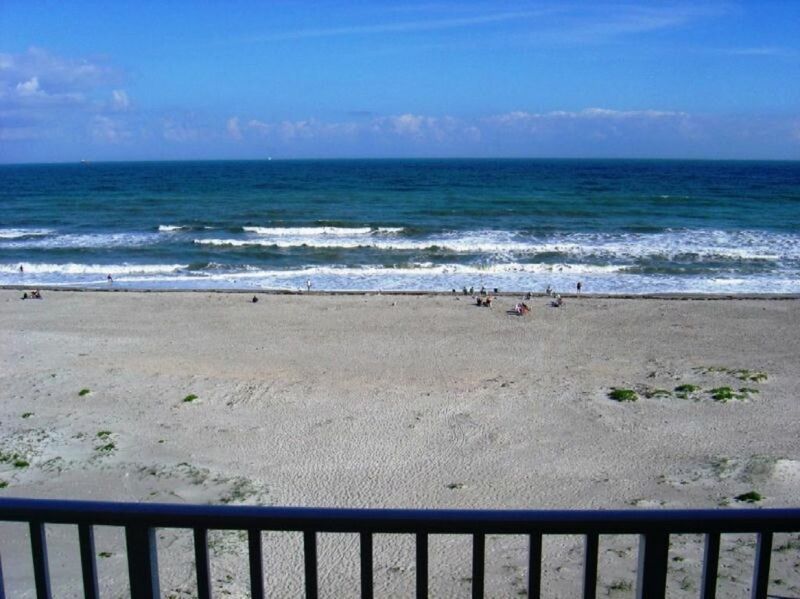 The condominium is only minutes away from the Cocoa Beach Pier and the Boardwalk. Check out the Night Life at 'Coconuts on the Beach', 'Heidi's Jazz Club', 'Cocoa Beach Pier', 'The Beach Shack', or 'The China Beach Lounge'. Sandcastles is located in Cocoa Beach about an hour away from Orlando, Disney World & the Airport. That's right, about an hour away from Orlando's major attractions including Disney World, Universal Studios, Epcot Center, Sea World, MGM Studios, and Animal Kingdom. You Will Be In A Perfect Location To Make The Most Of Your Vacation Days!!! The condo directly faces the ocean!!! The Large Master Bathroom has a corner Jacuzzi Bath and Dual His & Her Sinks!!! Beautiful view of the ocean from the balcony. Enjoy the sounds of the waves rolling in while you sit on the balcony taking in the wonderful view!!! The balcony directly faces the ocean providing a dynamic view of the ocean and beach! Go through a private gate to get to the warm sandy beach and dive into the ocean!!! This is a direct ocean front condo that's private balcony directly faces the ocean. This is a direct ocean front condo that's private balcony directly faces the ocean. Enjoy the sounds of the waves rolling in while you sit on the balcony taking in the wonderful view!!! There are lots of linens & towels!!! Private Washer & Dryer located in the condo for your convenience!!! Lots of private parking in a fenced area!!! There is a Private Wireless and Hardwire Internet connection in the condo! Wireless Internet is also available in the Recreation Room!!! The kitchen is equiped with everything you need for preparing your favorite meals!!! Great DIRECT OCEAN view from the Private Balcony!!! The condo has hurricane rated doors which have a 3 to 4 inch rise to insure the door is strong enough to with stand a the winds. * Lots of Private Parking in the Complex. * Also, Wireless Internet access is available in both the condo and the Recreation Room. Condo was clean and well stocked. Can’t beat the beautiful view! We had an amazing stay! Great location and nice unit. Really nice oceanfront condo. The kitchen is well stocked and lots of gear for the beach . Plenty of nearby shopping and restaurants . Be aware that traffic can be tough, and getting out of the condo parking lot is sometimes a challenge . Ron is easy to work with and takes good care of his unit . Thank you for your wonderful comments!!! We truly enjoyed this property with the perfect view of the beach!! Doesn't get much better!! Beach views, and well stocked kitchen. Only complaints I had was the living room furniture needs to be replaced as the two couches are not comfortable & I believe are outdoor furniture. Recliner comfy but squeaks and is dirty. (Probably with sunscreens and oils that people don't wipe off from beach) Beds were not that comfortable either. But overall would stay here again. You can't beat the ocean views! About an hour east of the Orlando Airport, Disney World and Universal Studios!!! Direct Access to the Beach through a private gate for Swimming, Sunbathing, or Fishing, There is a Heated Pool, Hot Tub, and Tennis Court in the Condominium Complex, Local Activities including Biking, and Jet Skiing, Check out the Night Life at 'Coconuts on the Beach', 'Heidi's Jazz Club', 'Cocoa Beach Pier', 'The Beach Shack', or 'The China Beach Lounge, remember excitement awaits you at the Major Amusement Parks in Orlando, which are only about an hour away!!! We primarily rent by the week from Saturday to Saturday but will consider shorter stays especially if the stay is within the same week. You are welcome to inquiry about "OFF" week rates but they will usually be higher, if quoted. There is a $400.00 per week security deposit that will be refunded shortly after your stay if the condo is returned in good condition. If you book through HomeAway or VRBO they keep your deposit until after your stay and will return it to you about 10 days after the end of your stay. We can take credit cards for an additional 3% inside the US or 4% outside. We usually charge more for Holidays, Spring Break, Fall Break & Special Event weeks. Rates are NOT final until confirmed by the owner. This property is in great condition and we want to keep it that way. As part of this effort we require that renters provide us their home address and a cell phone number where they can be reached while they are in Florida. Also, if you decide to rent the property you will be required to sign a contract to insure that we know who is using the property and everyone understand the terms and conditions. We strongly advise you to purchase "TRAVEL INSURANCE" to protect you from unexpected emergencies!! !